Choosing the Right Gas Furnace Installer - Norms Mobile Service Ltd. While gas is becoming more and more popular for home heating, so are contractors installing the heating appliances. With so many choices, it’s becoming hard for homeowners to distinguish from a trustworthy company to a handyman trying to score a job. The issue we have come to realize is the effect and power of the internet and how it can turn an unlicensed handyman into what seems to look like a legitimate company. 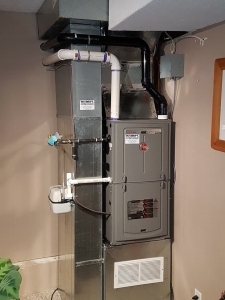 We are going to help homeowners spot the frauds and recognize the companies that have been trained properly to install your furnace and even how to recognize the outstanding installers. The first sign of a trustworthy organization is the length of time they have been in business in Nanaimo. It isn’t often that a back-door company has been able to stay in business for very long. Another way to distinguish the good from the bad is to ask the contractor for referrals. A good company will be pleased to show you what past clients have said. This goes hand in hand with word of mouth, so don’t be afraid to ask neighbours, friends, or family if they have either heard of the company or if they have used them before. A company you can trust is one that doesn’t shy away from questions. Always ask the contractor that is bidding for the job what kind of insurance they have. If something does go wrong by chance, you don’t want to be stuck with a company that can’t cover themselves. Also, if you get a weird feeling about the contractor, ask to see their certificates. It isn’t only illegal, but its very dangerous to have someone without a gas license install a gas furnace. The most common mistake we see homeowners do is pick the cheapest quote. We can’t stress enough how directly price relates to quality. That refers to quality of the workmanship and the product they are installing. If you narrow it down to several good companies giving you quotes, follow these tips to find the great one. A great gas furnace installer has years of experience installing gas appliances. A great company might also be an exclusive product dealer with a manufacturer. They also install quality products, have great insurance, licensed installers, and years of business in Nanaimo.